After years of recession and a less than stellar economic recovery, growing numbers of worker are feeling the emotional toll. Many of them feel undervalued and stressed out, and they're dissatisfied with their jobs, a new survey finds. More than a third of workers regularly experience on-the-job stress, and about half say inadequate pay significantly contributes to those feelings, according to the poll, commissioned by the American Psychological Association. In addition to stress and money woes, 43% of workers polled also fret about lack of career growth and advancement opportunities, and heavy workloads. Nearly as many were concerned about unrealistic job expectations and long hours. Further, less than half (43%), say they are adequately compensated in non-monetary terms or are recognized for their contributions in the workplace. What's more, it appears employers aren't doing all they could to help workers cope. The survey found that only 57% of workers were satisfied with policies their employers put in place to help employees balance the competing demands of work and family life. Further, just 52% of employees said they feel valued on the job. 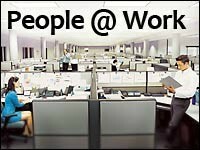 Only two-thirds reported being motivated to do their best at work, and about a third said that they intend to seek employment elsewhere within the next year. That workers are succumbing to increasing levels of stress isn't news to Wendy Kaufman, CEO of Balancing Life's Issues, a Ossining, N.Y.-based consultancy that provides corporate training on a variety of workplace issues. Reached Friday, Kaufman said her staff was conducting three workshops on coping with stress that afternoon alone. The sources for stress that Kaufman and her staff find mirror those of the APA study -- fallout from the recession. Even if people are working, they still feel vulnerable to job loss. "Their jobs [are] still not secure," Kaufman says, and those who have survived layoffs are left wondering how long before they, too, join the unemployment lines. "The vast number of people, I would say, are worried," she says. "Worry and stress are just tremendously related." Contributing to the problem are poorly designed employer programs that aren't effective in combating stress. The issue is further exacerbated by a dearth of adequately trained professionals in the field to teach such skills, which, Kaufman adds, should have been learned at an earlier stage in life. "The fact is that we are now asking adults to relearn a skill that should have been taught to [them as] children," she says. Parents today need to teach their children how to be good time managers very early on, she adds. Knowing how to use time effectively, along with other organizational skills, is key to keeping stress in check. The good news is that some employers have developed effective programs -- including eight that the APA recognized with its Psychologically Healthy Workplace Award last week -- that help to create healthy workplace cultures that benefit both workers and employers. By developing programs that increase employee involvement, improve health and safety and aid in striving toward work-life balance, among other factors, those employers have significantly reduced rates of employee turnover and chronic stress while increasing job satisfaction, APA says. The results show that despite the uncertainty that exists in the current economy, employers can cultivate workplaces where workers are both productive and happy. It's a growing trend, says APA Chief Executive Norman Anderson. "And it is our hope that all organizations will eventually have some type of psychologically healthy workplace program."